Lightly brush tomatoes and serrano chilies with extra virgin olive oil and roast in the oven for approximately 30 minutes at 400 degrees. Meanwhile, bring a large pot of water to a boil. Add the whole tomatillos (husks removed and rinsed) and boil for approximately 5 minutes or until they become soft and lose their bright color. Drain and rinse well. Place tomatillos in a blender with cilantro, salt, cumin and dried oregano. Once tomatoes and Serrano chilies are done roasting, allow them to cool and then peel off their skin. **Tip for easy peeling, place roasted tomatoes and chilies in a plastic bag and allow to cool, skin will peel off easily. Add peeled tomatoes and chilies into the blender and puree all of the ingredients until it becomes a smooth sauce. Remove the chicken from pot, allow to cool and then shred. Add shredded chicken back to large pot. Add the chicken back into the water that you cooked it in. Once the sauce is made, it gets added to the pot as well so all of the soup comes together. Add low sodium chicken stock and the drained and rinsed hominy to pot. 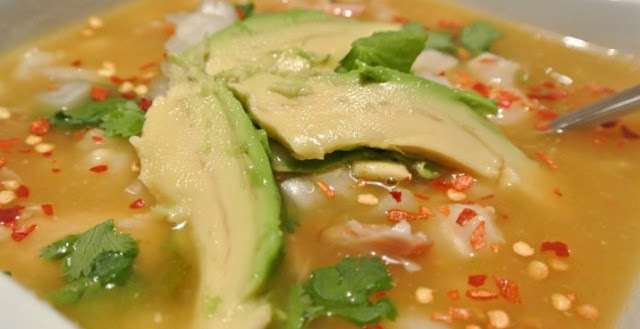 Serve in bowls and allow each person to garnish their own bowl of posole.